During the past few months, I have been seeing more and more references being made to a new type of zoo exhibit. 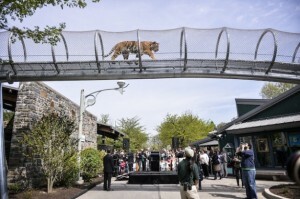 This one consists of a trail made of steel and mesh and raised above the ground and visible to all the guests at some point in their zoo journey. 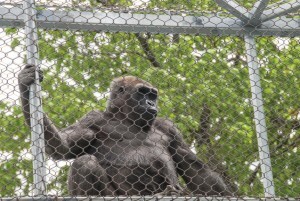 This new “exhibit” has been touted as the way to get animals moving throughout the zoo, increasing their locomotion opportunities as well as increasing their behavioral enrichment. The “Tube Trail”, as I will call it, that comes to mind is the habitat trail at the Philadelphia Zoo, which was the first and is probably the largest. Now other zoos are talking about developing these same systems. As a zoo designer I have to always question new exhibit design to see if it is really something that will be considered “state of the art” or “just another sad attempt at being relevant”. Before everyone starts yelling and screaming “You did the same thing at the Jacksonville Zoo” let me explain the difference between the two as I see it. 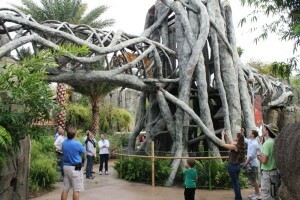 I will start with the Jacksonville Zoo “Land of the Tiger” exhibit designed by our firm. 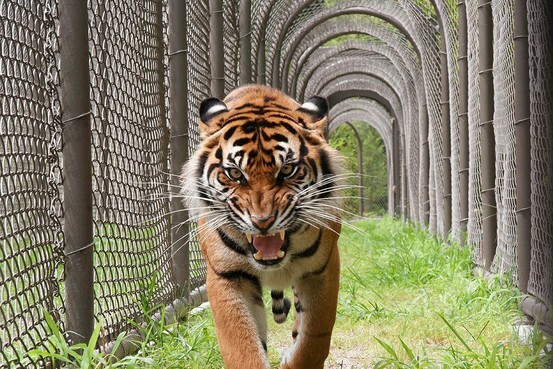 This exhibit boasts an almost 1000 foot-long tiger trail. The idea came from Dan Maloney, Assistant Director of Conservation. Dan thought that much of the stereotypic behavior we see in tigers (i.e. pacing) is really their need to patrol their boundaries as they do in the wild, and with limited boundaries in square box exhibits, it looks as though they are pacing and that it is not a normal behavior. With this idea in mind, the team came up with the trail. As I stated earlier, the trail is approximately 1000 feet long (305m), of which less than 10% is not on grade. 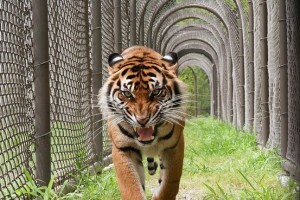 The reason for this is to allow the guests and tigers to cross paths without any difficulties. We chose to put the tigers above the guests to maximize their comfort and while they are realistically in a mesh tube, we treated the structure to look like a fallen strangler fig to give the tigers a sense that they were still somewhat hidden from the public. The majority of the trail is on grade, behind the scenes as much as possible, with fleeting views of the tigers by guests. This is the real difference between the two systems. Tigers on the ground where the naturally occur in the wild with the ability to hide from the public. This allows them to patrol and scent mark as they would in the wild. The other system, the raised tube, has what I consider a number of problems with its functionality. First, some of the animals put through the tube never or very seldom leave the forest floor and travel through the trees, as I guess this is what they are trying to depict. This includes tigers, gorillas, other big cats, etc. So if we are trying to give them enrichment that is species appropriate, these animals should be on the ground and not in the air. The second problem I see with the design is that most of the animals going through this system are not using their specific type of locomotion that they would in the wild. Gibbons typically brachiate through the trees, not walk on branches. Gorillas, which typically spend most of their time on the ground, use quadrupedal knuckle-walking as their main type of locomotion. In these mesh tubes, you see them walking bipedally, hanging onto the roof mesh with their hands. 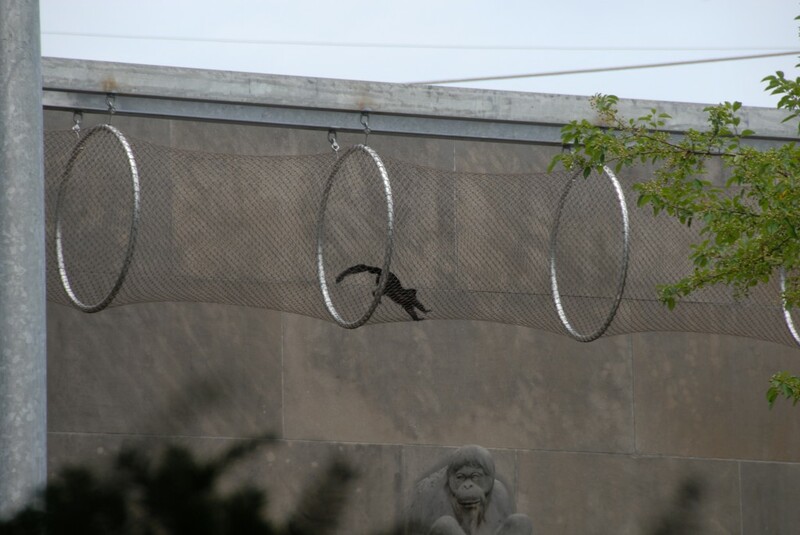 The same can be said for Orangutans and a number of monkey species, this is not the appropriate structure for their individual locomotion needs. Problem number three, for me, is probably the most disturbing. When I first started designing zoos in the late 80”s, it was imperative that all animals be given the opportunity to get away from the public view and not feel surrounded. At PJA, we still feel this is one of the basic tenets in our zoo design. The comfort of the animal is paramount, while the guests view secondary. This is not to say that we don’t want our guests to view the animal. We do! 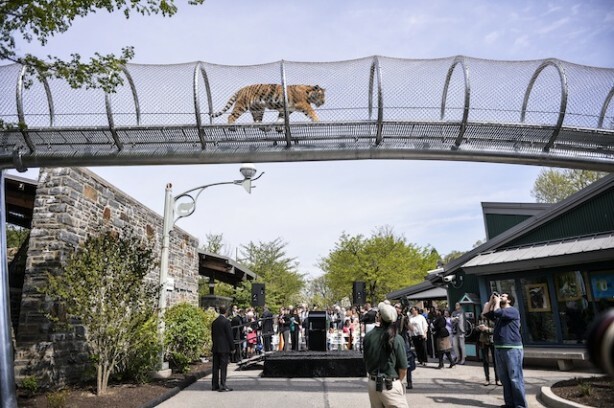 And that is what makes zoo design so challenging, comfort, stimulation, safety and appropriateness for the animal while still allowing them to be visible enough to satisfy the needs of the zoo goer. So I for one hope that this “tube trail” is a fad, and like all fads finds it’s appropriate time to die. We will not be doing something like a giant transfer chute and calling it an exhibit. There have to be better options. It just takes a lot more thought and design time to get to a better place. Zoo Design: Master Planning, What’s the Appropriate Time Frame? The trails have their good uses but they are few.